The good news is that the user data is stored in MySQL, a well-known database management system. The bad news is that there’s more to restoring your Open edX platform than simply restoring the databases. 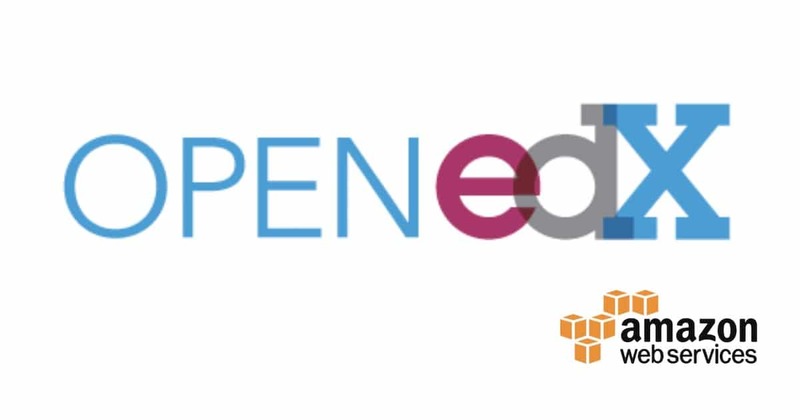 Get your Open edX instance back online in less than an hour with this how-to guide. This article focuses on the two truly critical data sources, MySQL and MongoDB, plus a couple of common pitfalls that can prevent your restored platform from running properly. First, the Django framework relies on a process called “Database Migrations” to ensure that the physical database schema in MySQL is consistent with the Django objects described in the source code. That is, Django programmers do not directly modify the MySQL database schema, but instead rely on Database Migrations to handle this for them. When you restore an Open edX MySQL database, you have to consider the possibility that the physical schema of the backup differs from that of the Django codebase. Second, Open edX relies extensively on a subsystem named RabbitMQ to asynchronously manage tasks. By “task” I’m referring to virtually every command button that a learner clicks while interacting with course data. RabbitMQ is invoked each time they provide a response to a problem, each time they interact with the discussion forum, provide a comment, record data in Notes/Annotations, request a password reset, and so on. These tasks are queued and then run in a first-in-first-out queue based on available server and network resources. Depending on the circumstances surrounding your need to restore or migrate your Open edX instance, there might be many hundreds or thousands (or millions) of pending RabbitMQ tasks in queue. If that’s the case then it would be prudent on your part to at least attempt to migrate these tasks as well. Furthermore, there are some common problems with migrating and/or restoring RabbitMQ configuration settings that we’ll look at in more detail below. Get your Open edX platform back online today. If your backup files are stored remotely then you’ll need to download a copy of the MySQL and MongoDB backup sets to your local Ubuntu file system. 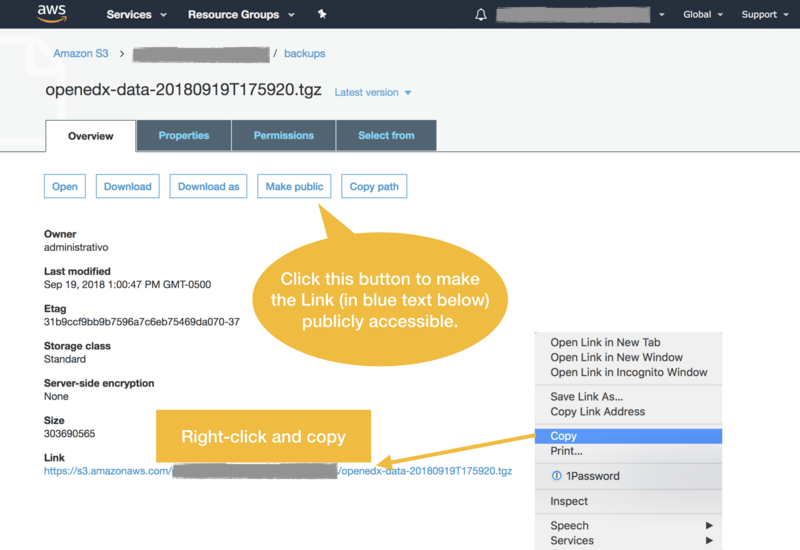 If you followed my instructions from my article, “Open edX Complete Backup Solution” then you can follow these instructions to download your compressed backup files from your AWS S3 bucket to your Ubuntu local file system. 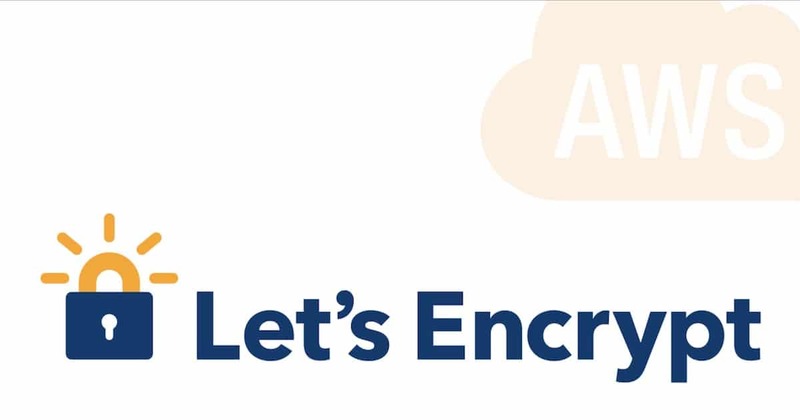 Make your AWS S3 backup file public, then copy the file Link (URL). Once your file has been made public you can download a copy of it to your local file system using the Linux wget command. # Download the backup tarball to the current directory. # x: This option tells tar to extract the files. # v: The “v” stands for “verbose.” This option will list all of the files one by one in the archive. # z: The z option is very important and tells the tar command to uncompress the file (gzip). # f: This options tells tar that you are going to give it a file name to work with. That’s it. You do not need to restart MySQL, nor flush any caches or buffers, nor do any other administrative tasks. MySQL is remarkably resilient in this respect. However it is really important that your perform Database Migrations in the next section. This process is simple to run and usually only takes a minute or so to complete. Running this procedure more than once will not harm your database. Make Migrations scans the Django objects in your Open edX application codebases to ensure that the physical database tables, fields and relationships are consistent. It automatically adds anything that is missing, and it keeps track of what it’s done. mongorestore ~/backups/path-to-mongodb-backup-folder/ --username admin --password "STRONG PASSWORD FROM my-password.yml in your home folder"
You’ll find additional information in the Official MongoDB Documentation. mongo --port 27017 -u "admin" -p "STRONG PASSWORD FROM my-password.yml in your home folder"  --authenticationDatabase "admin"
Given that you just restored all of your MongoDB course data, plus multiple MySQL databases and you potentially made schema modifications via Database Migrations, restarting the Open edX platform is a prudent idea. For most administrative tasks you only need to restart the LMS and CMS but in this case its a good idea to restart everything. Hopefully your Open edX instance is running now. If so, then you should next review the application logs for both the LMS and CMS to look for errors. You can attempt any combination of the following trouble-shooting methods, testing your results after each adjustment by attempting any operation in your LMS such as providing a response to any problem, or by requesting a password reset email. The correct internal IP address for address RabbitMQ is 127.0.0.1. However, sometimes Ansible will incorrectly populate this value with the actual value of the server’s internal IP address, such as for example, 172.16.102.101. I often encounter this problem whenever I reinstall RabbitMQ during platform upgrades. Edit this file if necessary, and then restart the RabbitMQ service. The following code block relaxes permissions for the username “celery”. This is anecdotally the same as setting permissions of a Linux file to “777”. If the source of your Celery problem is permissions then this will eliminate the problem, noting however that afterwards you should seek more information on the ramifications of relaxing Celery permissions in Open edX (sorry, but I’m no expert). sudo rabbitmqctl set_permissions -p / celery ". *" ". *" ". *"
If you followed my guidelines for a Native Build on Ubuntu 16.04 LTS then you (hopefully) have a file named my-passwords.yml located in /home/ubuntu. 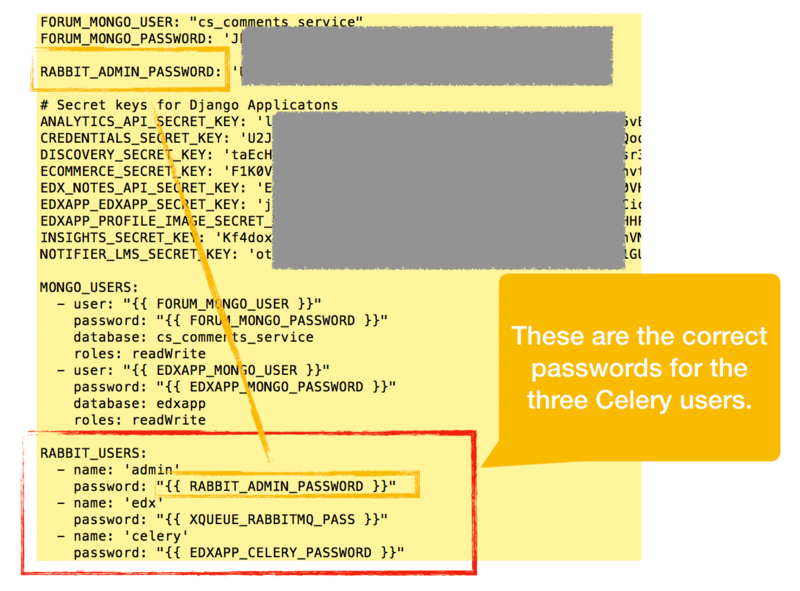 Per the illustration below, the passwords for the three Celery users is located at the bottom of this file, noting that in each case the value of the password is referenced from elsewhere in the same document. I’ve attempted to illustrate how this referencing scheme works by highlighting the appropriate row in the file for the “Admin” user’s password. ansible-playbook -c local -i 'localhost,' ./run_role.yml -e "role=rabbitmq"
If your site uses comprehensive theming and you’ve restored your custom theme from a backup then it’s probable that you also need to recompile your static assets with Paver. Take note that this process runs for around 15 minutes, and your Open edX platform will not be available until the process completes. Also be aware that if your theme contains any compilation errors then your Open edX platform will almost certainly break. xqueue_consumer RUNNING pid 12066, uptime 3:09:07. Kindly help out if you can. hi chris, it looks like your Hawthorn native build did not complete. you can confirm by reviewing the file /home/ubuntu/install.out and possible also /home/untuntu/nohup.out. install.out should contain a neat report of the Ansible activities for the build, of which there are upwards of 400 tasks. if you don’t see this report at the bottom of install.out then it definitely did not finish for some reason. often you can simply re-run the installation procedure and it’ll pick up where it left off. Hi Lawrence, there was an error saying Ansible failed. I tried to rerun the installation script but the same error occured. Here is from the log. Any advice? these are actually information-only messages from mysql. the restore should work anyway. regardless however, you can read more here — https://django-mysql.readthedocs.io/en/latest/checks.html — on how you can tailor the behavior of Django’s interaction with MySQL. hope that helps!